Good hiking around Castle Lake. This winter has proven to be an unusual one thus far. I had planned on focusing the blog on winter hiking and related subject matter. When the first snow fell back at the beginning of December it was assumed that that would be end of hiking in the high country, since surely more snow would be coming soon. Instead, we have had one of the driest winters on record so far. Rather than feeling frustration because the snow has blocked access to most of the Trinity Divide and other high mountains, thoughts now turn to our need for water and how to handle the drought conditions over the coming summer. One trip over the Pit River Bridge on I-5 will dispel any optimism that our water resources are in adequate condition. Shasta Lake looks more like its ante-impoundment canyon than the largest reservoir in California. In the face of conditions like that, winter access to favorite hiking destinations seems like a trivial matter. Still, if we are to endure a drought, we ought to find some profit in the midst of our plight. The high places in the Trinity Divide are still easily accessible, the skies are clear, and the temperatures are warm for this time of year. We should take advantage of the opportunity while it lasts. If one is willing to brave lower temperatures, the high country trails are still in fantastic condition for this time of year. One of the most convenient options for hiking at the higher elevation is the mountains that loom above Lake Siskiyou. 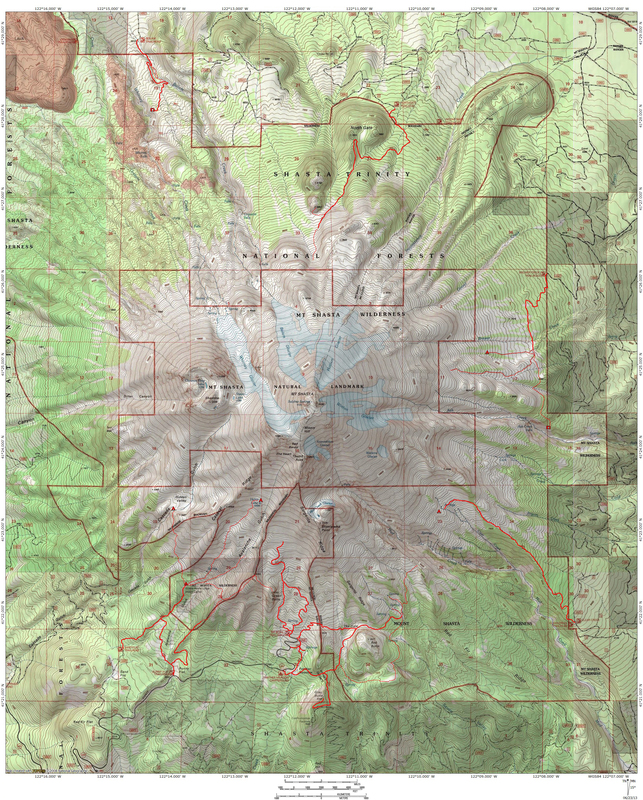 In terms of access, this means the Castle Lake area and the trails reached by means of South Fork Road. A total of 9 trails begin in these two areas and reach diverse destinations, many of which include alpine lakes. There are 3 trails around Castle Lake and 6 along the South Fork Road. 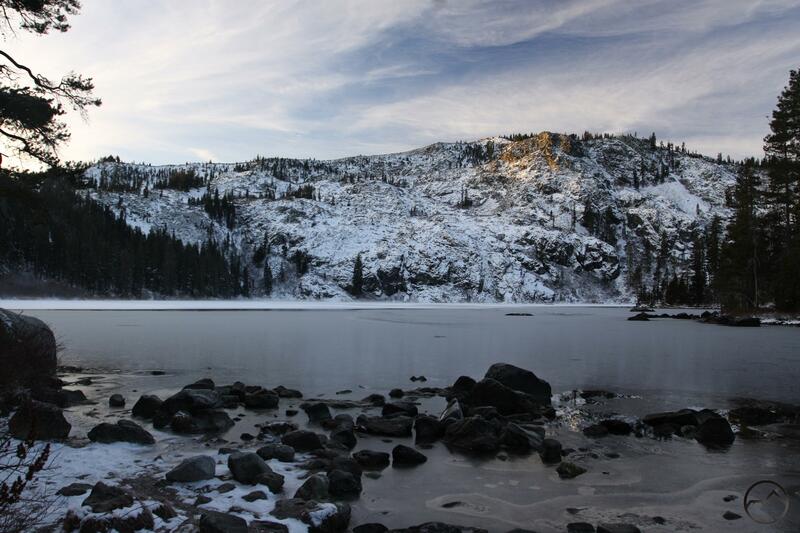 Of course, there are numerous hiking options around Lake Siskiyou but since they are options more appropriate to normal winter conditions, it is better to avail ourselves the unusual access of the higher trails. It should be noted that reaching the upper section of South Fork Canyon may require a 4×4 or AWD vehicle. Some snow and ice persist on the road and could be a problem for a car with two wheel drive. Still, the conditions are good and access easy with the right vehicle. While I have not driven the dirt roads that lead to the trailheads for the Gray Rock Lakes and the Soapstone Trail, all the other trails along the South Fork and Castle Lake areas are easily reached off of paved roads. I have taken a couple of trips to this area with my kids over the last week in order to investigate the conditions. I was surprised by how clear things generally were at the higher elevations. Even the Trinity Alps, visible from Gumboot Saddle, were quite free of snow. I was impressed with how much water was flowing in the Sacramento River and many of the creeks. Still, it was discouraging to see how little water was in Lake Siskiyou. It is a reminder that even though there is decent flow, the water level is still terribly low. A bare Mount Eddy above a very low Lake Siskiyou. Thick ice encrusts the still swift moving Sacramento River. Atypical winter conditions along the Sacramento River. One of the interesting benefits of the current weather situation is the opportunity to observe the higher elevations at cold temperatures but lacking the mantle of snow that typically smothers everything at this time of year. The lakes are either completely or partially frozen. The seeps, normally wet and mossy spots on the ground or hanging on steep slopes are now clusters of giant icicles. Pockets of snow still cling to shady portions of the cliffs that tower over the lakes. Even the Sacramento River and the creeks are covered with thick sheets of ice. It gives the running water an unusual appearance when it presses against the underside of the ice or emerges raucously from beneath the sheets. All things considered, we are in urgent need of rain and snow but we might as well enjoy the circumstances while they last. Get out and experience the unusual conditions now. I am confident that February and March will bring some much needed relief and go a long way towards pushing us back to normal. We have seen this happen before. Just thought I would share with you that I made it up to Gray Rock Lakes yesterday. The road to the trailhead was a mix of packed snow and ice, definately a 4×4 situation. I’m just blown away that getting there is even an option this time of year. If this dry spell unfortunately continues, I might just have to check out Big Bear Lake. Thanks for the update on the Gray Rock Lakes. It doesn’t surprise me that the road is in that condition. As far as Big Bear Lake, definitely head up there. It is a great lake. If you do go, leave really early to give yourself plenty of time to scramble up to Little Bear Lake. It is also a fantastic lake and it is a shame to hike all the way up to Bear and check out its little siblings! I wouldn’t dare neglect little and wee bears. Of the three I would have to say little bear is my fav. Wow, the colour on the mountain and the peak behind Castle Lake is excellent. Morning light for both of them? It was morning for both of them. 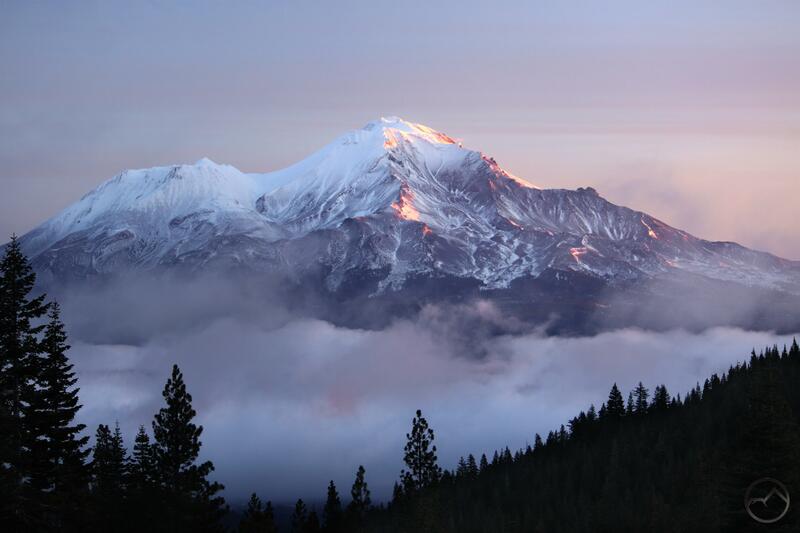 The view of Shasta is about 0.25 miles from the end of the road. From the end one need only walk a couple dozen yards to the edge of the lake. It is a pretty amazing area!